I’ve been using Drupal for the past 13 years and I have been swinging from a fierce love and prolonged era where I used it for everything to steering away from the monolithic beast and building more nimble and customized solutions typically using node.js , mongodb, elasticsearch and angular or react. One of the key elements that has always driven me nuts was how hard it was to create a simple page with Drupal. Elementor was built by an israeli wordpress theme development company called pojo.me to scratch their own itch and has built an opensource page builder , their project has rapidly been growing and gaining adoption and excitement throughout the wordpress community. It has grown to more than a million active users in 18 months. I had the luck of hanging out with the Elementor team when I attended wordcamp paris about 2 years ago and was astounded by how cool and intuitive elementor feels when building wordpress pages. Although Elementor was built to be a wordpress builder alot of the design choices where implemented in a way that elementor is it’s own thing pretty independent from wordpress implementation and technology. The “editor” lets you create and reuse complex visual layouts and creates a json based representation of composed layouts and the “parser” takes that json and transforms it to html. This independent implementation let us believe that we can adapt elementor to run on Drupal — and with the generous sponsership of the Elementor team we built a version for Drupal! Beyond the basic (mind blowing) features of Elementor (which you can see in the video below) we added a few additional things that are Drupal specific which give a taste on how we can harness some of Drupals power and inject it to the awesome layout and design reuse capabilities introduced by Elementor. But what about the “Drupal way”?? Drupal famousely has a code which is often refrerence to as the “Drupal way” and this really does not feel like the drupal way (where anything I use and present was described as nodes, fields and entities). This feels very different but I would argue that the “Drupal way” recently has been to raise our heads beyond the Drupal community and the Drupal way of doing stuff and adopting and harnessing the momentum energy of other projects and communities. This trend can be seen by the success in adopting symfony, twig, composer and other projects. I think that Elementor is an amazing way to tap in to a rapidly growing project that deals in the frontend and makes page composition for Drupal as easy as wordpress, wix or squarespace. 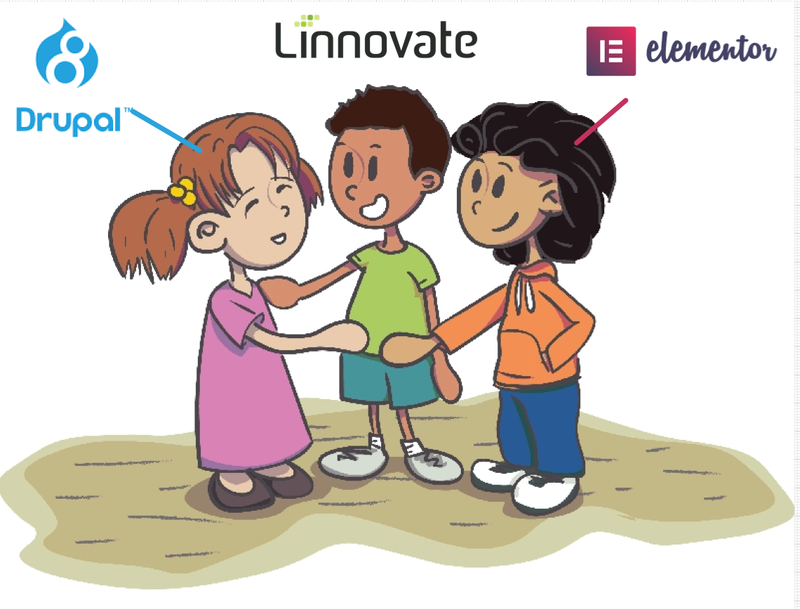 Elementor and Drupal together will help us at Linnovate build component driven websites and web applucations and I see Elementor as an important part of managing the complexity derived from breaking down pages to components. These are the first baby steps of what I hope will be my personal way of reconnecting with Drupal and loving it just as I did when I started out with Drupal 4.5 about 13 yrs ago.